On Friday 30th of August the weather forecast was pretty decent so we headed on our first cyclotour from Dedinky. 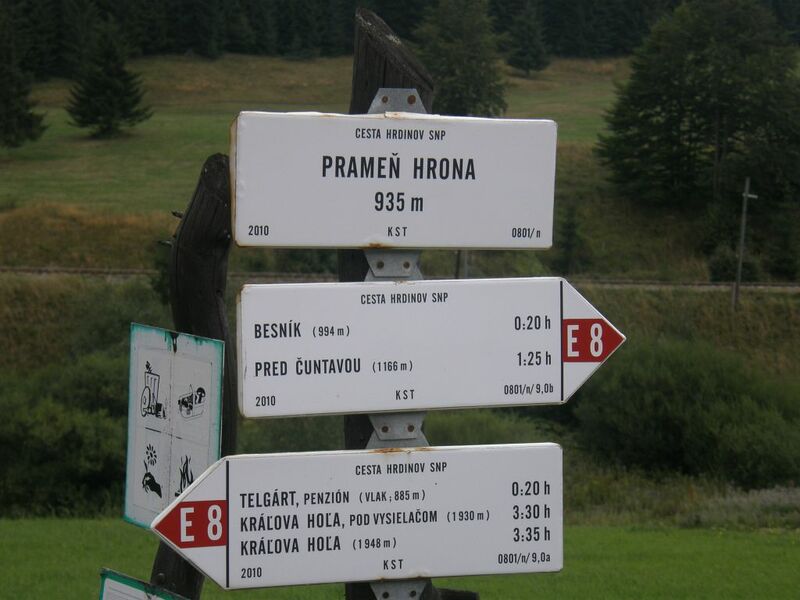 I have planned longer route up to Nízke Tatry, to the riverhead of Hron under the Kráľova Hoľa mountin. With the reserve plan, if we would like it, of going up to Telgárt or alternatively we will have lunch and then climb up back to mountains. Despite the weather forecast the sun did’t shine, it was cloudy and even the temperature was not as the promised 18°C, I guess not more then 15°C. Fortunately Olinka has bought warm cyclist trausers for both of us, also waterproof jackets, so we didn’t have to be worried these drops of rain what tried to frighten us. Only under the mountains we announced that maybe some caps over the forehead and ears would come in handy. Or some headband. But we weren’t cold too long. From Dedinky we climbed our first hill nearby the dam and then we started climbing on the main street towards Stratená. On the map the hill didn’t look so bad but now it has warmed us up pretty well. 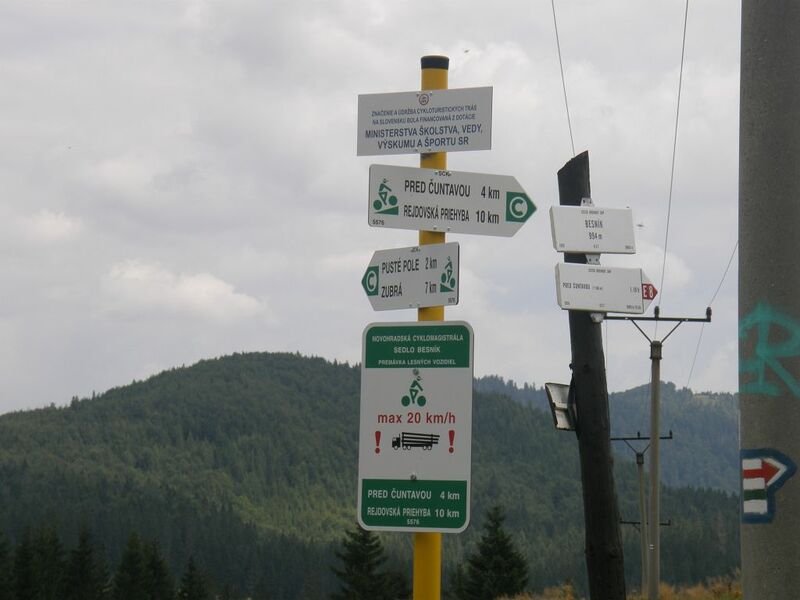 Just on the top o fit I’ve seen turning down the hill to the right and on the pillar symbol of the cycle route to Dobšinská Maša, so we agreed we’ll try it on our way back. We absolutely didn’t enjoy the downhill to Stratená because the main street is so damaged that man has to be very attentive to avoid holes and at the same time to use breaks carefuly otherwise you can not only break your helmet but also your head. This roud down the hill has chilled us again but we we awared of the fact that we had to climb this hill on our way back. The Stratená village is very beautiful and there are plenty things for people to come and look for. Road sign „Tunnel“ has scared Olinka just after passing the village because she was in this region for the first time. 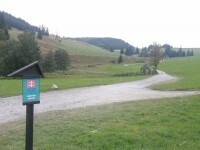 But before getting to it we turned right to the old road through Stratenský kaňon. Road blocks prevent cars to cross this area on the both sides of the road. What a shame, maybe I would try this adrenaline after those years again. Although there are many information tables in the canyon we haven’t met anyone there so it was just the two of us who enjoyed the bicycle tour. We have passed by the turning to Dobšinská ľadová jaskyňa and also to Vernár constantly leaned against the pedals because the whole route was rising. At least we didn’t suffer from cold. 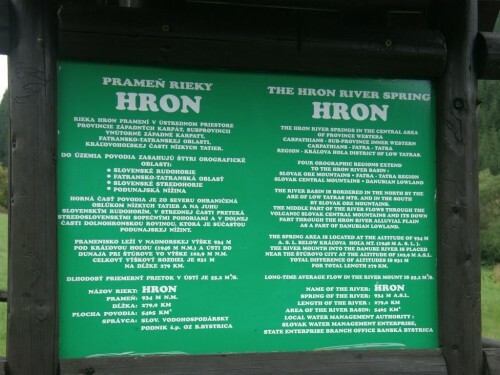 We know the way from Telgárt to Vernár (from the car), so we were longingly expecting the turning point of the road and the well known silhouette of the river spring. We didn’t have time to stop by when we were passing by in our car so we compensated it now. We went down the steep hillside on the good asphalt and turned left to the gravel parking lot. It wasn’t a real parking lot but just a wider road. Small car can turn here, bigger would have problems and if there were more cars there would be a real trouble. 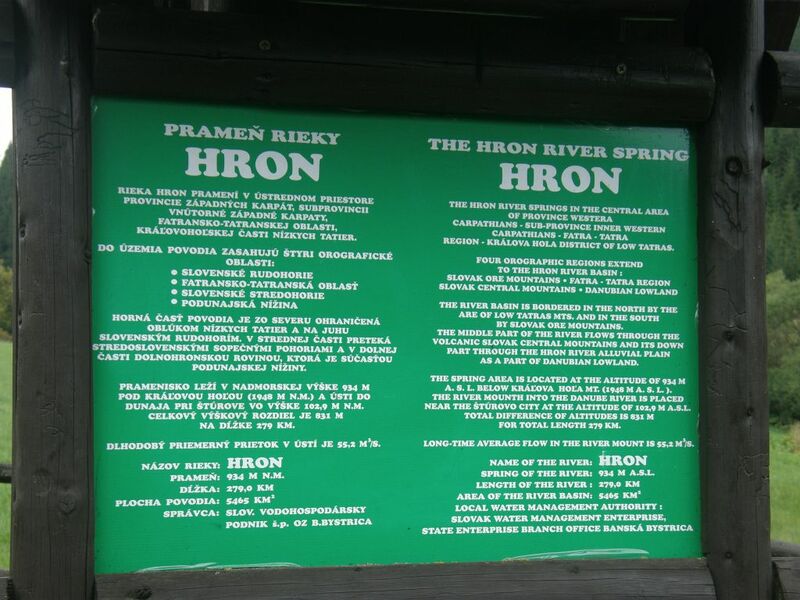 The interesting fact is that there are navigation tables which send you right to the river spring of Hron as the touristic attraction but when you come here there is just nothing. Not even solid place for the rest without hindering others or stand for bicycles or a place to sit down and have a lunch or snack. Even the trash bin looks like it’s here from the spring and there is no one to empty it. It’s a weird way to call this tourism. There is even an advertisement for cheap accommodation even with wi-fi connection but I’m not sure if Olinka will be brave enough to try accommodate in this region again. They should at least clean the trash bin. The second photo. I have missed the trash bin. I didn’t see it just like the ones who should take care of this place. When dressed like this I can ride a bike even in cold weather. 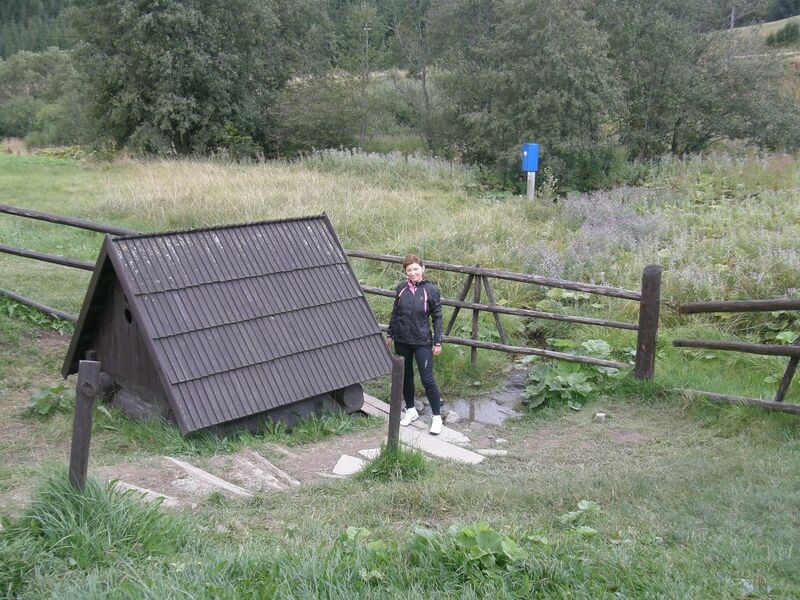 The river spring itself is protected by this shelter. Tempting offer but experiences tell it by themselves. View from the main street. We decided not to go to Telgárt. I have taken some pictures and before we started feeling cold again we hit the road and climbed some more hundreds of meter higher, to Besník, from where I tried to take pictures of Kráľova Hoľa in this bad weather. Maybe one day I’ll be able to climb it by bicycle. 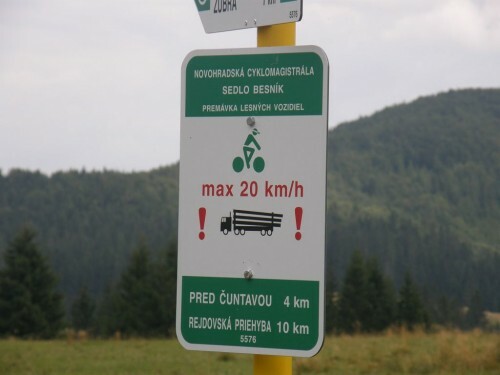 I noticed sign of cycle route to Rejdovský priehyb but after bad experiences with the surface of cycle routs of this region.. From the beginning it looks fine but then, you know.. When they try to catch the cyclist they sing him nicely.. or pour under his wheels. And then we break our throats. These are roads for trucks with wood and it’s how they look. Nothing can be changed by the marker of the insurance company. Kráľova Hoľa in the clouds. If only these cycle roads lasted more than some hundreds of metres. We climbed a bit higher and then started to go down to Pusté Pole. Before the crossroad to Vernár I saw turning to the woods marked with cycle tour sign so we decided to give it a try and see how it looks. So we turned left. The trip desitnation should be after 3,5 km so we see where do we get. The surface was asphalt, good quality forest road, in some parts with added gravel. Slight rise so it was pretty nice. After 2 kilometres we get to the point where: a) the road started to rise b) asphalt road changed to rocks c) there was a forest cabin for forest workers with a place to rest, sit and an open fire. So we stopped by, had some muesli bars we always take with us, drank som water and after quick rest we went back to the main street. Just on our way back we realized it was road to the hill so when coming back it was like our bikes made it by themselves. I guess our fitness shape is coming back. 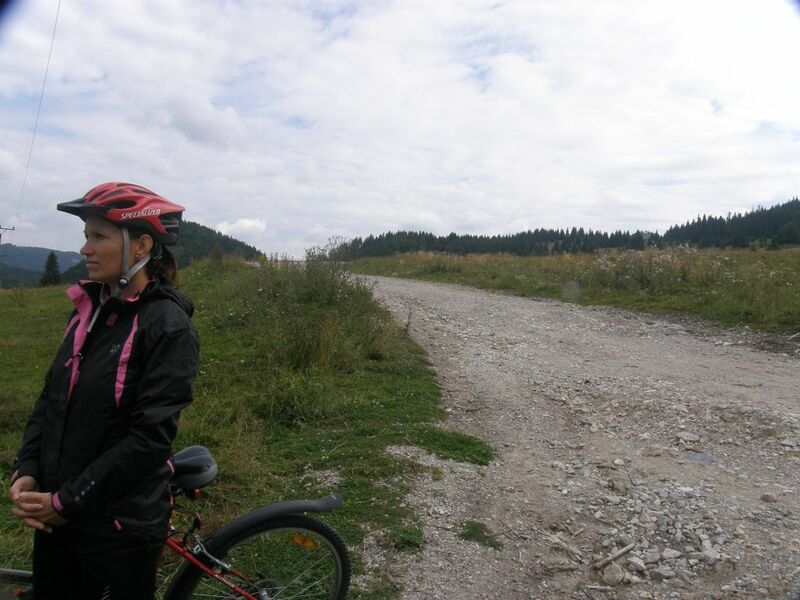 If you’ll be passing by with your bicycle and will have time, go these two kilometres into the forest, it is worth it. Nice road, nice nature, nicely stended time. And I don’t say this very often in Slovenský raj! Although this place is part of the National Park Nízke Tatry. From this point the is road to Stratená (14 km) only decreasing, except some humps, so we didn’t exhaus too much and get mostly mentally for the hill climbing between Stratená and Dedinky. We got pretty hot again, but I have to say we didn’t have to push our bikes once, we were able to bike it up. 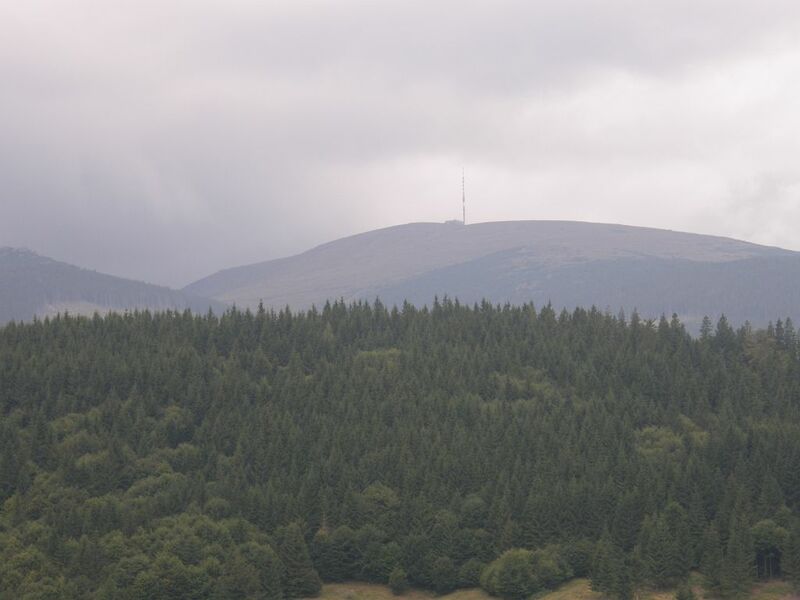 Just under the top of the mountain we turner left to the Dobšinská Maša with marked cycle route. And we shouldn’t do that! And I don’t recommend it for you too if you don’t belong to adrenaline cyclists and if you consider your bike as a tool for your tours and plesure. Gravel surface has after some hundreds meters changed to field road with big white rocks sticking up and when passing through this person is thinking what will be the first to be crushed – a wheel or a knee. Fortunately, it was dry outside so it didn’t slide as much. After some other hundreds meters the surface changed again and the rock road was filled up with deep car lines that only heavy trucks could drive by. We decided to push our bikes for a while – I like my bike and also my spine which after the surgery doesn’t need to be damaged again. Shame, I didn’t take pictures o fit. And I can’t imagine going the way back, which means up the hill. In the village the surface changes back to asphalt, although the hill is still pretty steep. We rode down, passed by the village or better said colony and on our way to Dedinky we had to climb up the mountaing again – for what I get „complimented“ from Olinka like „What was the reason to go down the hill if we have to climb it up again?“ I got her point in contrast with the one who let the route to be claimed as „cycle route“. The fact is that people in this region have really weird way in understanding what tourism means. After a while we came to a barrier wall and after the crossroad to Mlynky we were unstoppably heading towards our pension, for which I will write a separate article. We made through out this trip 55 km overall and we have climbed 1290m. Unbelievable, two months ago I was exhausted after 300 metres. Sure, the temperatures were back then around 30°C. I also attach the map of the route if you wanted to repeat our trip. But on your way back rather drive the main street. 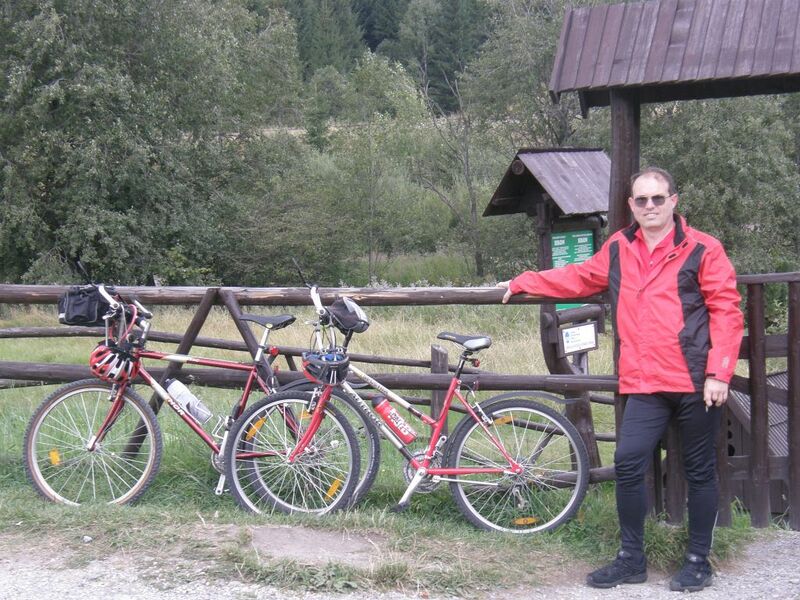 This entry was posted in Traffic and tagged cycling, Hron, Kráľova Hoľa, National Park, Nízke Tatry, river, sport. Bookmark the permalink.